Second-graders at P.S. 276. Some parents fear the school will become overcrowded. BATTERY PARK CITY — All of the children waitlisted for Battery Park City's popular P.S. 276 will be able to attend the school this fall after officials decided this week to open an extra kindergarten class. The fifth kindergarten class will accommodate all of the roughly two-dozen children who are on P.S. 276's waitlist — which means that those kids will not be sent to Chinatown for kindergarten as the Department of Education suggested last week. Word of the extra kindergarten class began spreading among P.S. 276 parents Tuesday, and a representative of the school confirmed it Wednesday morning. "I am ecstatic that the waitlisted children for P.S. 276 will be able to attend their zoned school," Karen Behrens, whose daughter was on the waitlist, said in an email. "It's what we were fighting for and comes as a relief." But Behrens and others said they are concerned that this is the second year in a row that P.S. 276, a new green school in southern Battery Park City, has opened an extra kindergarten class to accommodate waitlisted families. Because the school is only designed for three classes per grade, some parents are worried that the city's decision to add extra sections now could hurt the school in the long run. Other Downtown schools have already been forced to close art, science and music rooms to make way for the area's baby boom. "This is a tragedy for our neighborhood," Tricia Joyce, a Community Board 1 member, said at a meeting Tuesday night. "We are overcrowding…these beautiful new schools." 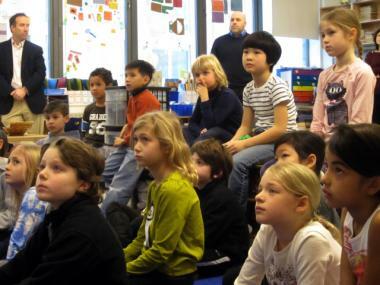 Joyce and other CB1 members urged the city to find an alternative Downtown space for the waitlisted kindergarteners, like Tweed Courthouse, so they do not overburden P.S. 276. The Department of Education did not immediately respond to a request for comment. P.S. 234 in TriBeCa also opened an extra kindergarten class — a sixth — to accommodate all of its waitlisted kindergarteners for the fall. As of last week, P.S. 89 in northern Battery Park City still had a waitlist of 16 children.